Marijuana isn’t just for smoking. 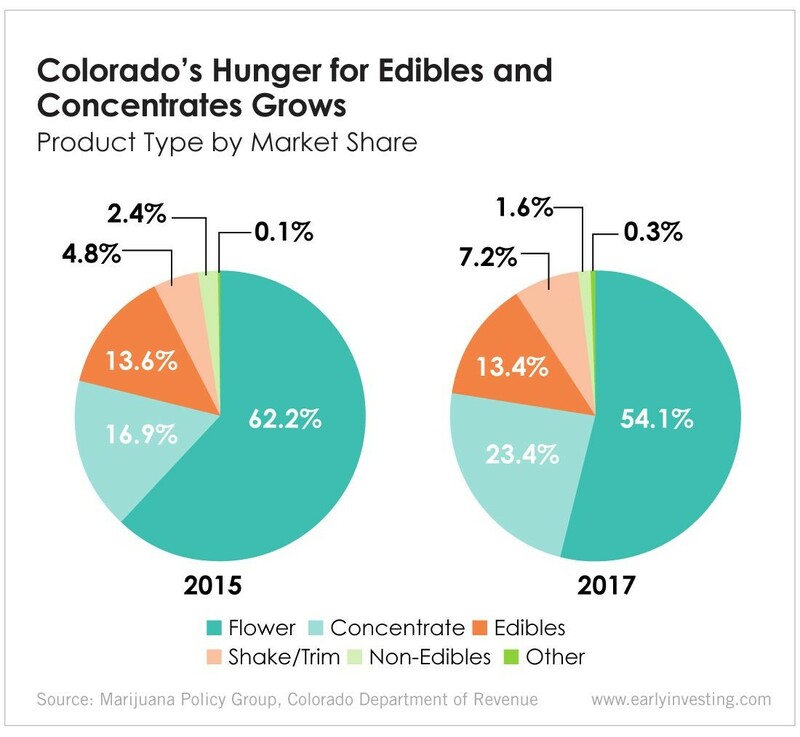 In Colorado, the market share of edibles and concentrates is steadily growing. In 2017, more than 36% of total sales were edibles and concentrates, compared with 30.5% in 2015. This data comes from a 2017 market update from the Marijuana Policy Group and the Colorado Department of Revenue. Edibles in particular had a banner year. In 2017, 11.1 million edible products were sold in Colorado. There is a very real and exciting opportunity for investors here. As Adam Sharp mentioned recently, retail investors are in a stellar position in the U.S. marijuana market. For once, the institutions on Wall Street aren’t the first in line to invest. Because marijuana isn’t legal at the federal level, institutional investors (hedge funds, wealth managers, etc.) mostly can’t access the market. Which means investors like you and me can get in on excellent cannabis companies that are still in their early stages and growing at phenomenal rates. So it’s definitely worth keeping an eye on cannabis companies that have a hand in edibles. Edibles’ popularity extends well beyond Colorado, earning a spot on the Specialty Food Association’s top trends for 2018. Consumers can get luxury vegan hard candies infused with CBD in Oregon, indica dark chocolate bars from Massachusetts and even THC-infused pretzels in California. Some European countries are prescribing cannabis edibles to help with autism and epilepsy. Experts trust that cannabis edibles can intensify the distribution of tetrahydrocannabinol, cannabidiol, etc. across the body and brain. Moreover, the growing investments made for cannabis edibles and rising awareness in the region are further propelling this regional market over the estimated time frame. It’s exciting to see medical marijuana research being conducted around the world. It’s also interesting to see how the market is shifting in a pioneering state like Colorado, which was one of the first to legalize marijuana. As the marijuana market expands through the U.S. and the world, we’ll be keeping an eye on it (and maybe buying some of that chocolate). It’s a great time to be an early investor. The post Edibles Market Grows in Colorado, Around the World appeared first on Early Investing.